The Service Flying Training School No. 18 (SFTS) opened in the fall of 1943 as part of the British Commonwealth Air Training Program, the largest such facility in western Canada. 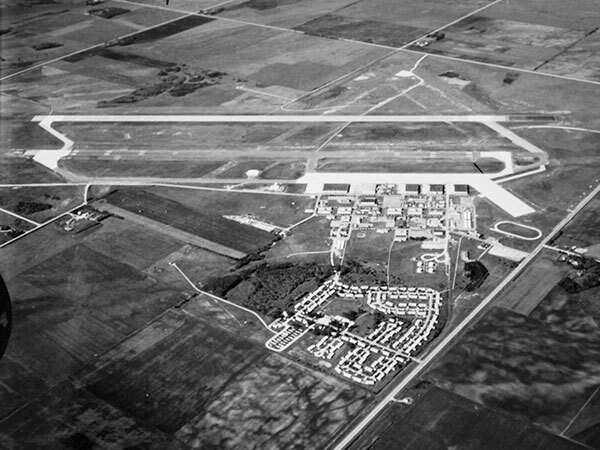 The site in the Municipality of Gimli had some 50 structures, including six double hangars, built at a cost of $1,250,000. Construction was done by a consortium of builders, including the Bird Construction Company of Winnipeg, W. B. Ramsay Construction of Regina/Lumsden, and W. C. Wells Construction of Saskatoon. The school opened formally on 29 October 1943, though classes had begun several weeks prior. An opening ceremony on 20 January 1944, attended by Municipal Affairs Minister William Morton, involved a air show demonstration and graduation. The event was attended by Municipal Affairs Minister William Morton and a crowd of 500. The school closed in June 1945 with staff transferring to Service Flying Training School No. 17. The facility was later used as an air cadet training centre and summer camp for western auxiliary squadrons. Facilities were upgraded and, on 8 January 1950, the base was returned to an active flying school for member countries of the North Atlantic Treaty Organization. At the time, the facility was Canada’s second such appointed flying school, known as No. 2 Flying Training School (FTS) with the other, known as No. 1 Flying Training School, located at Centralia, Ontario (near London). The FTS was active by the summer of 1950 with hosting capacity for 1,000 base staff and military trainee pilots. 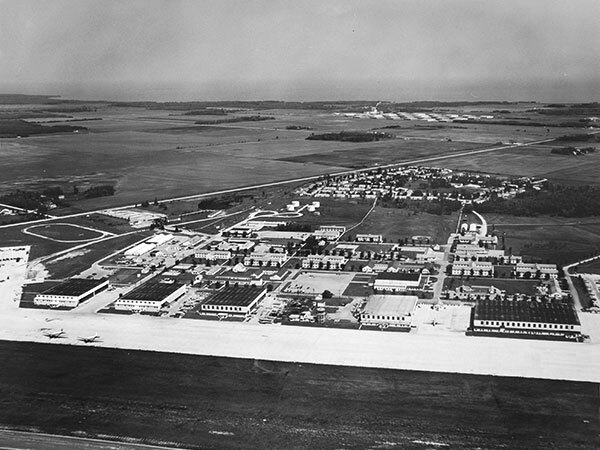 The FTS operated separately from the RCAF Gimli Station, though under a shared Commanding Officer. A grade school was also operated nearby for the children of base staff, and the site had a 35-bed hospital. The base was closed 1 September 1971. “Vast Manitoba RCAF plans,” Winnipeg Tribune, 8 August 1942, page 5. “Another Gimli contract let for $1,250,000,” Winnipeg Tribune, 8 August 1942, page 15. “School opens,” Winnipeg Tribune, 2 November 1943, page 4. “Brandon air graduates attain high standings,” Winnipeg Free Press, 3 September 1943, page 2. “Gimli school officially opened by “air war”,” Winnipeg Tribune, 21 January 1944, page 10. “Wing-Cmdr Goulding Promoted to Group Captain,” Winnipeg Free Press, 20 June 1944, page 5. “Gimli Air School may train men for Far East,” Winnipeg Tribune, 2 June 1945, page 17. [Photo caption], Winnipeg Free Press, 14 July 1947, page 3. “Gimli-based aircraft bomb field in fast-moving aerial manoeuvres [sic],” Winnipeg Free Press, 16 July 1949, page 21. “Battle tempo returns to Gimli; RCAF School goes full-time,” Winnipeg Free Press, 20 December 1950, page 1. “Where to put them all? Town asks cottagers for help,” Winnipeg Free Press, 20 December 1950, page 1. “800 Western Air Cadets fly, play, eat at Gimli,” Winnipeg Free Press, 29 July 1950, page 3. “Training opens at Gimli Station with no fanfare,” Lethbridge Herald, 12 January 1951, page 2. [Photo caption], Winnipeg Free Press, 24 January 1951, page 3. “New crop of ‘refresher’ pilots ‘rarin’ to go at Gimli school,” Winnipeg Free Press, 10 March 1951, page 9. “Old soldier’s gift,” Winnipeg Free Press, 19 April 1951, page 3. “Inquiry to seek crash cause,” Winnipeg Free Press, 23 October 1954, page 1. “Fog grounds polar plane, singer drops in on RCAF,” Winnipeg Free Press, 14 January 1956, page 3. “Gimli C of C elects new officers,” Winnipeg Free Press, 10 December 1962, page 13. [Photo caption], Winnipeg Free Press, 26 April 1971, page 11. “Gimli given jet plane,” Winnipeg Free Press, 5 July 1971, page 55. Manitoba School Records Collection (GR2047), Goulding School - Committee Minutes, Archives of Manitoba. We thank Robert Morrison for providing additional information used here.